Fascia are the thin elastic tissues that envelop every part of your body into an interconnected whole. For the last two decades, yogis have approached fascial release mainly through long passive stretching or applying static pressure with balls and foam rollers. Recently, however, we are seeing a global wave of new approaches working with fascia through slow, subtle movements, muscular action and unstructured flows. Fascia work is becoming an undeniable “new black” in the international yoga community. 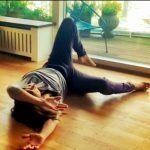 Birgitte will guide you through a softly flowing practice where movement arise out of deeply felt sensation. The practice awakens a more supple form of strength and flexibility similar to the kind you see in little babies. We will explore moving in ways that challenge your habituated patterns of neatly aligned yoga postures and allow you to tap into the creative repertoire of your very own body. The class alternates between structured movement-enquiries done together and slow open flows that invite you to explore your own internal experience of the body. Birgitte is there to facilitate the wisdom of your feeling body so you can hear its gentle messages more clearly. Therefore, the workshop will be experience based, meaning 100% practice and 0% theory! Birgitte is happy to discuss theoretical implications and yoga anatomy after the workshop but will not get you in your head while you are working on the yoga mat.